When Zach and I were born, our parents must have counted and recounted: limbs, fingers, toes. The complete set. They would have been disbelieving - nobody dodged the split between Alpha and Omega. Nobody. Born as twins. Raised as enemies. One strong Alpha twin and one mutated Omega; the only thing they share is the moment of their death. The Omegas live in segregation, cast out by their families, as soon as their mutations become clear. Forced to live apart, they are ruthlessly oppressed by their Alpha counterparts.The Alphas are the elite. Once their weaker twins have been cast aside, they're free to live in privilege and safety, their Omega twins far from their thoughts. Cass and Zach are both perfect on the outside: no missing limbs, no visible Omega mutations. But Cass has a secret: one that Zach will stop at nothing to expose. The potential to change the world lies in both their hands. One will have to defeat the other to see his or her vision of the future come to pass, but if they're not careful both will die in the struggle for power. I could not stop listening. I plan to listen to it again. It is gripping and characters are well developed. I could not stop listening. Look forward to next book in the series, just pre-ordered it. Wherever there is "Them" vs "Us" the story of the Fire Sermon's Alpha and Omega twins is played out. Like her namesake of antiquity, Cassandra sees beyond the reality of the present to what could be. Like her namesake of antiquity, she seems to be the only one. So...what if there were no "Them" or "Us"? Worth a listen if you like this genre. Set in a dystopian future, the main heroine Cass (an Omega) is on the run from the Alphas. 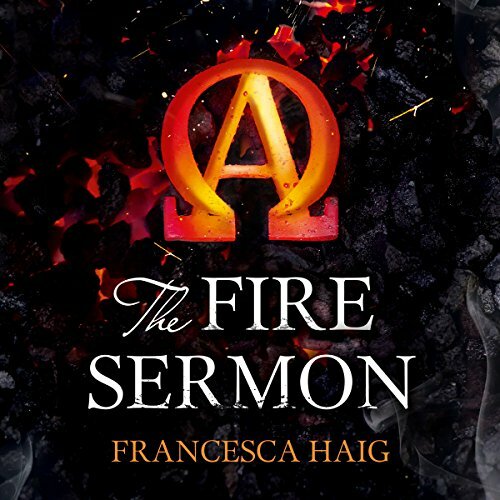 Would you listen to The Fire Sermon again? Why? Yes. First book I've read/listened to since the Hunger Games, which is a worthy book in the post apocolyptic young adult dystopian fiction genre. Original. Gripping. Well developed characters. Looking forward to the next book. l bought this book on a curious whim. I was intrigued by the title. Upon starting the first chapter l was hooked. l was drawn in. I am not familiar with the author or the narrator, however, l am happy l chose this book. lt's suspense filled, beautifully written, characterised with verve and delicately presented. The story is jarring and yet pulling. This book is an infectious story. it was an interesting, thought provoking listen but it suddenly ends just as you think its getting to the crux. It felt like after all the detail and story building, the author couldn't be bothered to carry on with it. If there is no second book then that us how it felt. Unfinished like she was mid tale, frustrating ending. This is in the style of a post-apocalypse YA book, but with the merciful absence of teenage hormones messing with the protagonists inner monologue! The 23yo heroine is rational and able to function like an adult even when there are males present which makes for a lovely change! The plot is good with twists I dint see coming, although re-listening the clues are there. My only minor grumble is the odd pronunciation of caldera, but that’s easily forgiven because he rest of the narration is wonderful. I like that the characters are easily distinguishable even from just one line or even a couple of words, with logical accents (ie, siblings have the same) which is something other productions should take note of! This book is a very interesting and unusual concept and one which keeps you on the run with Cass and Kip. This is a really good start to the trilogy and I look forward to the next two books. l cant recommend this book enough and am looking forward with great anticipation to the sequel.